Like most preschoolers, my daughter loves dress-up. In fact, she wears her dress-up clothes more often than her regular clothes. We even have a rule: At home, you can pick your clothes, when we go out, Mommy picks the clothes. 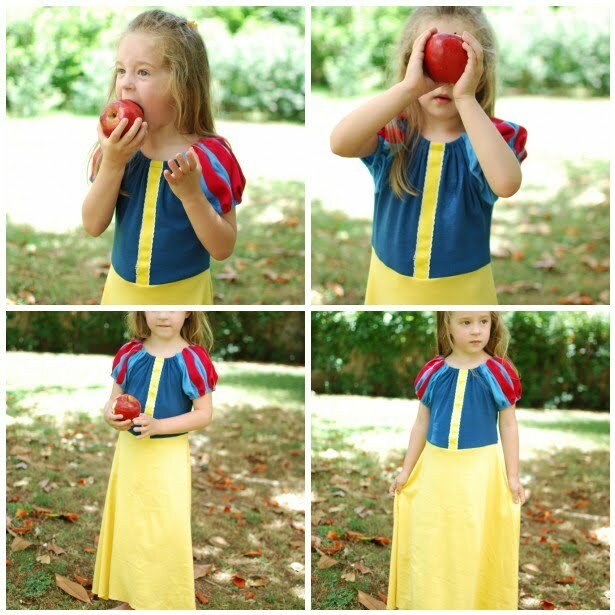 So the other day she asked me to make her a Snow White dress “on my sewing machine”. How could I say no? As I stood in my sewing room, taking inventory of my fabrics, I realized I had nothing even remotely close to the right fabric. Then some of my brightly colored knits caught my eye, and I had an idea. She lives in these clothes, right? I mean, she wears them everyday and often sleeps in them too. So why not make them comfy? So I pulled out my trusty favorite pattern and constructed myself a knit, peasant-style, Snow White inspired dress. No frou-frou, no zippers, no buttons, no hemming. At first I couldn’t remember exactly where each color was supposed to go, but I was able to find 1 or 2 hints around the house. 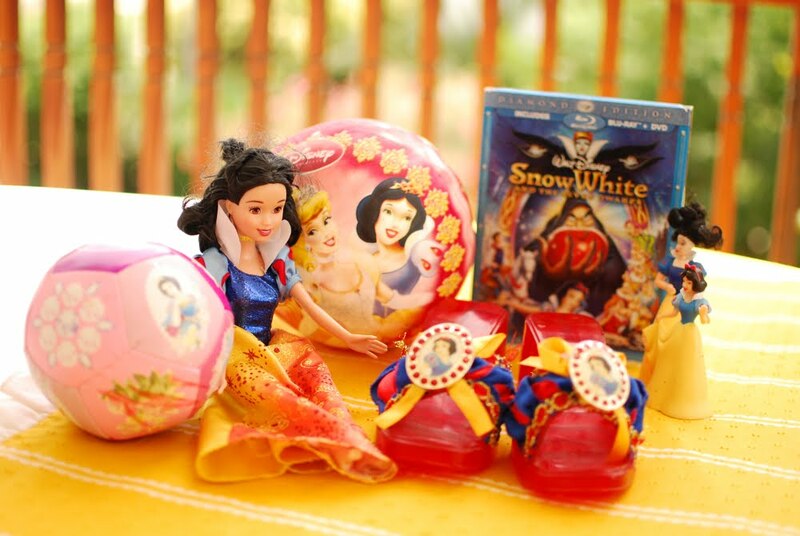 It seems there is a big discrepancy among Snow White paraphernalia regarding the yellow stripe down her bodice. The original movie has it, but some of the licensed images don’t. Since I had the absolute perfect ribbon for the project, I decided to include it. You can always count on a 3 year old to keep you humble. You did so great! I LOVE that first picture! You can’t make a GREAT dress like that without a Tutorial, can you???? Oh my word that is just the cutest!!! Perfect! Wow that is amazing. I have a very “young” 13 yo who loves princess dresses but they don’t make them in her size. I’ll have to try this for her for pj’s. On the sleeves, did you sew the strips first and then cut the sleeve pattern out? I’ll check back here in case you answer. I did the sleeves in the worst way possible – I cut them out of the blue fabric first, then I slashed them and sewed in strips of red. Then I pleated the red so those strips would be closed on the top and bottom, but open in the middle, THEN I made the elastic casing, which with all those seam allowances and pleats was so bulky I could barely get the elastic through. I don’t recommend it. Your suggestion of sewing the strips and then cutting out the pattern is much better and probably won’t look any different. I think the cuteness of the pleats in the red fabric was totally lost once the whole thing was gathered anyway. That is just so cute and I love that you made it from knit fabric. You could make a killing selling these if you chose too! Love this new take! and yes, the yellow band – while controversia – is definitely a keeper! This is adorable!!! 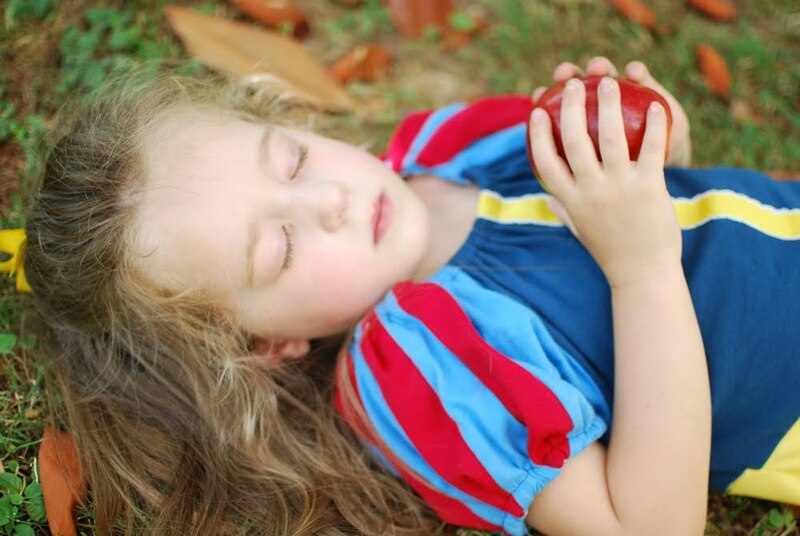 Reese is in love with snow white!!! I might have to whip one up for her one day :) Thanks for the inspiration & for adding one more thing to my to-do list :) Any suggestions on where to buy good knits? I have been trying to find different colored/white striped knits and having a hard time! I got most of those knits at Joann.com and fabric.com, but hartsfabric.com, chezami.com, crybabysboutique.com, thefabricfairy.com, and aboveallfabric.com all have a good selection of knits too. Also, if you have any kind of fabric district, or mom & pop fabric stores near you, they are sometimes better about carrying knits than some of the chain stores. How fabulous is that? You definitely win some mom points for this! Did you make the shirt following the pattern and then just add the skirt? It’s great! My kids do the same thing–thanks Mom, now how about…. This is so cute and what a great idea making in comfortable fabrics. Of course I love the no hemming aspect too. You are so creative and always inspiring me. I’ve always wondered what would happen if I used knit to make one of Smootch’s ‘princess dress’ requests, since she usually never wears them more than once because they ‘scratch’. This looks great, thanks for the inspiration! Oh my that is so cute!!! Great job! That is just adorable! Clever thinking on using knits as well! I love this! It looks so great! I wish my daughter was old enough to wear it… and that I knew how to sew a knit! An adorable princess dress for an adorable little princess. So cute and I love the fact that is is comfy! What a wonderful creation! Thanks for sharing that! You’re right! Knit dress up dresses are the way to go! Mine love theirs, too. I’ve never done a peasant style one, though. What a great idea! Omgosh, I LOVE that! I’m totally going to make Samster one. Beautiful work Adrianna! 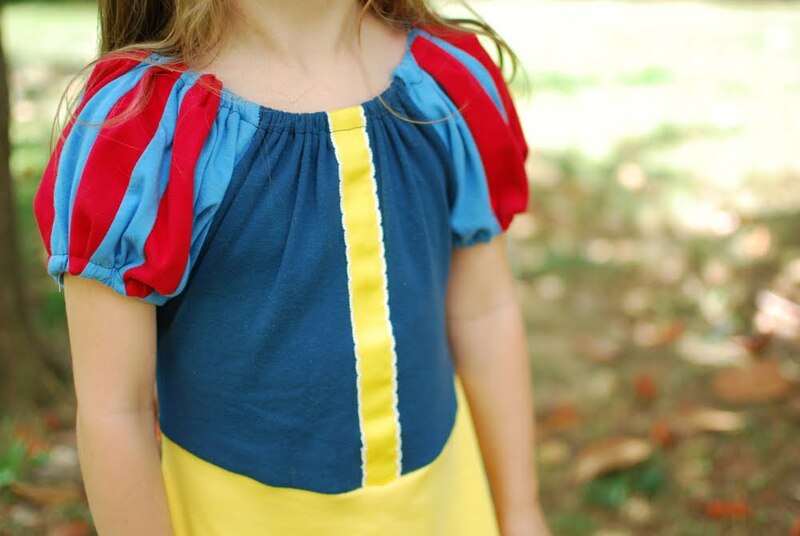 My 3 year old daughter absolutely loves Snow White…what a perfect dress! Now, why didn’t I see this before my daughter’s birthday?? why? This dress is great! I think I might have to give it a try- or at least refer Grandma here with her superior sewing skills to mine. 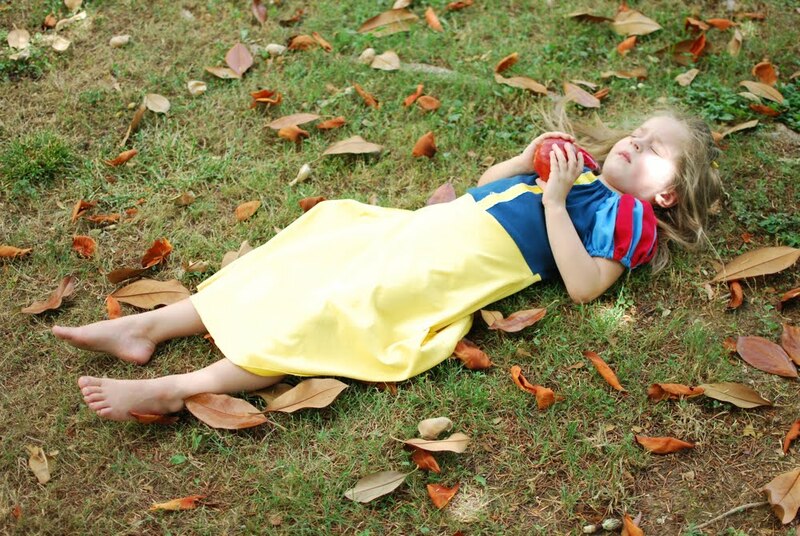 I think we have all the same Snow White paraphernalia as well. This is so great. Such a simple pattern and such a beautiful result. I featured this dress on my blog. Still planning on attempting your Belle dress. This one is so cute, too (and simple, and comfy-looking)! Thanks for posting!! I just came across this post again. When you first posted it it, I was not feeling too confident with my sewing skills, but now I think I could do this! I bet I even have all the fabric needed in my to be recycle bin. (Including a brand new xl yellow knit tee I picked up off the walmart $3 rack last year.) I come back and post a link when I am done. I ended up making this today :) I did my sleeves differently though – Since I am 9 months pregnant and short on patience and I have a 3.5 year old who wanted her dress RIGHT NOW – I just sewed on red ribbon to the sleeves. No cutting and piecing. I firmly stitched them at the top and bottom and evenly spaced them and it looks nice and floaty on her. If I have anymore yellow knit after I finish the Belle tutorial for my 5-year-old, I will certainly make another! Thank you so much!